Last Monday night I drove to the Embassy Suites in Cary to attend a retirement reception for Rich Ducker. Dave Owens, Adam Lovelady, and Fleming Bell (along with his wife, Meg) also were there to honor Rich. The event was held in connection with the mid-winter workshop of the North Carolina Association of Zoning Officials (NCAZO). NCAZO was founded and its constitution adopted in a meeting at the Institute of Government on January 16, 1981, which is shortly after Rich joined the faculty in 1980. 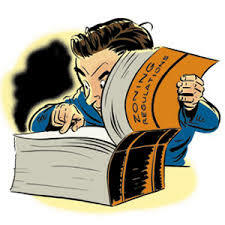 Rich and NCAZO have partnered over the last 33 years “to promote the technical and legal quality” of zoning administration and enforcement in North Carolina. The program honoring Rich was heartfelt and lovely. It was advertised partly as a roast, but it was restrained because, as one person said, “there isn’t anything bad to say about Rich Ducker.” A steady stream of zoning officials went to the podium to talk about how important Rich had been to their careers. All of them mentioned his willingness to answer their calls and respond to their emails. One appreciated Rich’s patience with any number of “stupid questions” over the years, always answered without making her feel the least bit stupid for asking them. Many talked about their personal friendships with Rich—it was clear that his influence has extended far beyond zoning questions. Rich has made a lasting impact on the professional practice of zoning and land use in North Carolina. His legal updates at their conferences, often done as part of the “Rich and Dave Show,” have been invaluable. One person remembered when Rich discovered clip art for his presentations, eventually becoming “the King of Clip Art.” Others talked about the importance of his written guidance, especially his many blog posts on Coates’ Canons. One mentioned his favorite post, or at least his favorite title: “Yer Cheat’n Heart, Tattoos, the First Amendment, and Preemption.” Borrowing from Coates’ Canons, another zoning official said that they all considered themselves Ducker’s Disciples. There was a slide show of photographs that featured Rich at various zoning conferences—my favorite was the one with a hula dancer in the foreground and Rich doing his own unique version of the hula in the background. In thinking about Rich’s contributions and their importance, I couldn’t help but reflect on the nature of our relationships with lots of other public officials. A number of the zoning officials who spoke were emotional and had to compose themselves before continuing their comments about Rich. It was because they have worked together closely—as partners in the professionalization of their field—over a period of years. It was because they know that Rich has been focused on meeting their needs rather than his own. It was because he has responded to their requests for assistance according to their schedule regardless of his other commitments. They trust and have great affection for Rich because they know that he cares about them, as public officials and as individuals. Those special relationships with public officials exist across all of our work, and they are largely responsible for the affection that so many of those officials have for the School. A lot of it comes from our advising work with officials, though it also comes from teaching and publishing. One reason we are having feedback sessions about creating a resource center in the School’s library is to see if we can do a better job of handling advising requests. A number of faculty members are overwhelmed by the number of requests regularly coming into them. Is there a way to manage those requests that will get officials what they need and simultaneously reduce the burden on faculty members? If you haven’t attended one of those sessions, I hope you will sign up for one of the two remaining ones. In thinking about advising, I often wonder how we might help faculty without reducing the level and quality of service we now provide to public officials. Would any organization intentionally lower the quality of a service that (arguably) is valued by its customers more than any other? I don’t think so. Put another way, are we willing to risk losing the kind of special relationships that we have developed with public officials partly because of our traditional approach to advising? At the same time, however, the quality of our advising service will suffer if faculty members in some areas are so overwhelmed that they can’t respond fully and in a timely way. A resource center in the library may be part of a solution, or the best answer to this quandary may be an altogether different approach. I know that faculty members have to be involved in crafting a solution that maintains a high quality of service that is sustainable. If we can figure it out, the same level of appreciation and affection that I saw at Rich Ducker’s retirement reception will continue to play out at faculty retirement events far into the future.